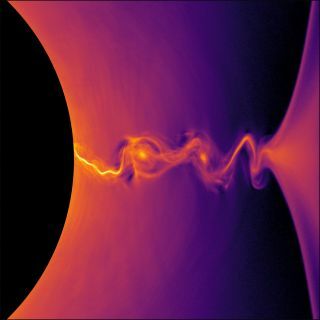 As black holes gobble up the matter in their surroundings, they also spit out powerful jets of hot plasma containing electrons and positrons, the antimatter equivalent of electrons. Just before those lucky incoming particles reach the event horizon, or the point of no return, they begin to accelerate. Moving at close to the speed of light, these particles ricochet off the event horizon and get hurled outward along the black hole's axis of rotation. The study was published on Wednesday (Jan. 23) in Physical Review Letters.